An all-star cast, tons of action, and a nearly global release. Sounds like a summer blockbuster? Of sorts. League of Legends, the spiritual successor to Warcraft III mod Defense of the Ancients, is coming to the Mac this summer for free. Designed by some of the best in the business using TransGaming’s Cider Engine, this online-only player versus player client-based game will let virtually anyone with a Mac draw broadswords and lead their minions on a quest to destroy their foes. “We’re young, we’re smart, and we’re putting this all into League of Legends,” boasts Conor Campbell of Riot Games. Bold? Yes. But Campbell and company may have the talent to back it up. If the look and feel of League of Legends is familiar to DotA players, that’s because Riot Games has taken pains to assemble a staff of talent that knows the source material well. Two of the original developers for DotA, Steve Feak and Steve Mescon, are on Riot’s team, in addition to creative talents from EA and Blizzard. Based on the blockbuster real time strategy title Warcraft III, Defense of the Ancients is one of the most popular player created mods of all time. It’s a free PVP real time strategy mod that has amassed a major global following, tournament circuit, and spawned its own sub-genre of game. League of Legends expands on the original source material by adding social features, new maps, new abilities and a whole slew of new champions to play as. But it keeps the fundamental formula the same. The objective of League of Legends is the same as Defense of the Ancients: You must defend your base while trying to destroy the enemy’s. You and your teammates are high-powered characters called “champions” who can purchase weapon upgrades, armor, and potions at your base’s shop. As you lead your side’s minions and destroy enemy minions and champions, you’ll gain experience that will unlock further abilities. Defense of the Ancients was renowned for its steep learning curve, and League of Legends hopes to rectify that by including a robust tutorial. Steve Mieczkowski, producer for Riot Games, explains that the goal for the producers has been to “make it accessible but make it deeper.” For advanced players, they’ll enjoy keeping track of stats like wins and losses, experienced gained, and their preferred characters. Meanwhile, new players will enjoy the intuitive tutorial that will acquaint players with the basic concepts of gamplay—all without being called a “noob.” During Riot’s demonstration, I played through the tutorial as “Ashe” the Frost Archer. Buying armor, gaining levels, and knowing where to go was easy at first, but after I was thrown into a more advanced game with bots, I realized that was much for me to learn. My champion this time, a knight with a desert-themed skin, was knocked out of combat by an enemy tower early in the game and had to respond back at base—this only cost me a few seconds, but it was nevertheless humiliating. Even with the tutorial, there’s a great deal of strategy that needs to be learnt. Part of the allure of the game is that you are your teammates need to create a larger strategy to deal with opposing champions. You need to decide where to deploy, where to gain experience, and when to coordinate attacks. If an enemy has a certain kind of tank attacking from the south, you need to figure out who, if anyone will confront them. To help foster a community, one element Riot is especially proud of is the social features of the game, including a new chat system. “We want to make it easy to play with your friends,” explains Mieczkowski. You can add people to your friend list who you’re playing with and see when they’re online. Teams can be quickly assembled and you and your mates can become a well-oiled machine. While free-to-play, players can purchase boosts and character skins with riot points that are bought using real money. But, Mieczkowski emphasizes, “We don’t sell power.” Only a fraction of the players pay to support the game, and even then the purchases won’t unbalance the game. Boosts can increase the rate you earn in-game currency, called influence points, or how quickly you gain experience. But runes, which are passive improvements like increased defense, can only be purchased by in-game currency that is accrued through playing. When you first start the game, there is a rotating set of 10 free champions to choose from. If you want to permanently unlock them, you’ll have to buy them using game currency. Every two weeks there is new content to the game, and Riot seems to be paying attention to their users. If a character is over or under powered, for example, they’ve taken pains to test it out and modify the character as necessary. 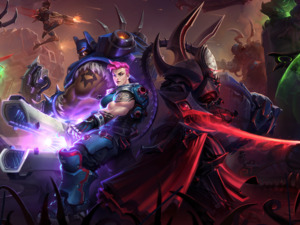 While the PC version of League of Legends came out in October 2009, Riot is shooting for a summer release of the Mac client. It’s free to download, online-only, and a must-have for fantasy RTS fans.